Every month this year, Lewisburg faculty and administration will be selecting a Chick-fil-A Student of the Month to recognize students who make a positive contribution to our school and community. 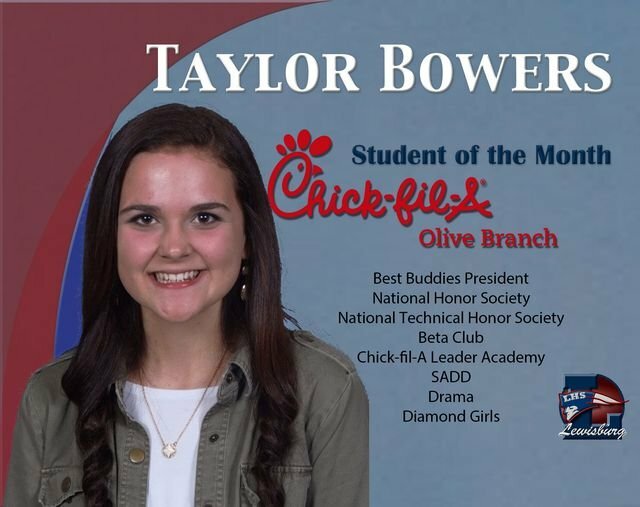 Patriot Vision is proud to announce that the Chick-fil-A Student of the Month committee has selected Miss Taylor Bowers as this year’s first student of the month. Taylor was nominated and selected based on her and leadership in developing the Best Buddies program at Lewisburg high. The mission of Best buddies is to help meet some of the needs of intellectually and developmentally delayed students. Her dedication to this special population of students has not gone unnoticed. Taylor has worked through the summer and into the school year organizing several fundraisers and socials for friends involved in Best Buddies. In addition to her commitment to Best Buddies, Taylor is a second year student in the Health Sciences program at the DeSoto County Career Technical Center. She is also an active member of the National Honor Society, National Technical Honor Society, Beta Club, SADD, Drama department, and is a Diamond Girl for the Lewisburg baseball team. Join us in congratulating Taylor Bowers, Lewisburg’s first Chick-fil-A Student of the Month. Thank you to Chick-fil-A of Olive Branch for sponsorship. Each Chick-fil-A Student of the Month will receive a meal card and T-shirt, compliments of Chick-fil-A.